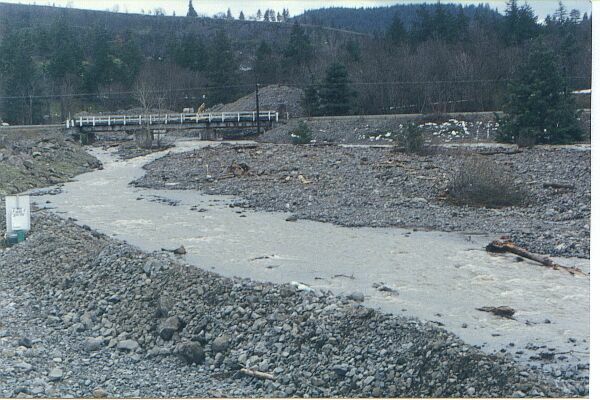 During the spring of 1996, Rock Creek flooded and filled its river bed with rock from the State Rock pit to the South. 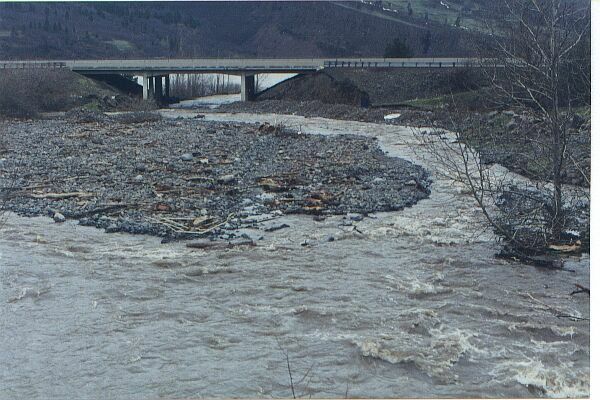 There is a rock slide that continues sliding into the creek during a flood and the river bed fills up to the point where the water does not have room to go under the bridges. 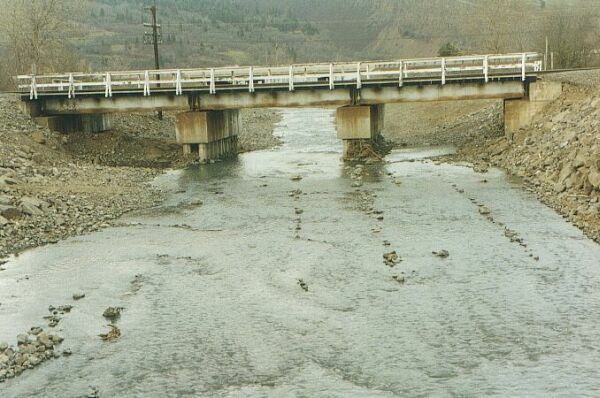 When the state showed up to look at the situation, the water was over the bridge and the fiber optic cable that connects to Eastern Oregon was floating in the creek. 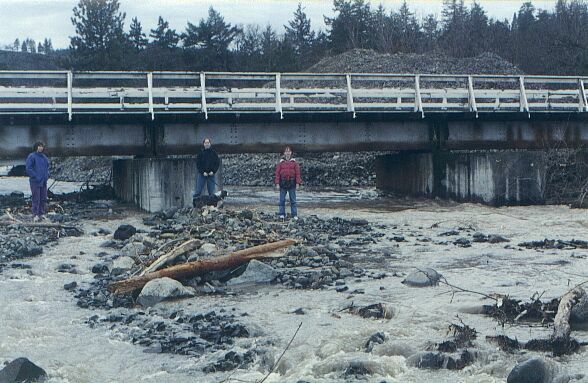 It normally runs under the old highway bridge but the water had torn it loose. If it had been broken by a stump or log the repair would have been very expensive and there would have been a loss of comunications to parts of Eastern Oregon. Rock Creek filled its bed with rock and then split just North of the Railroad Tracks. 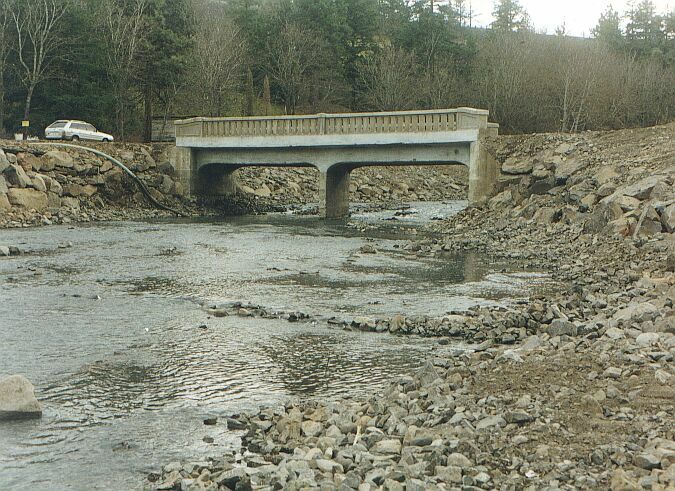 The West branch went into the lake on the West side and then came back into Rock Creek near the I-84 over pass. 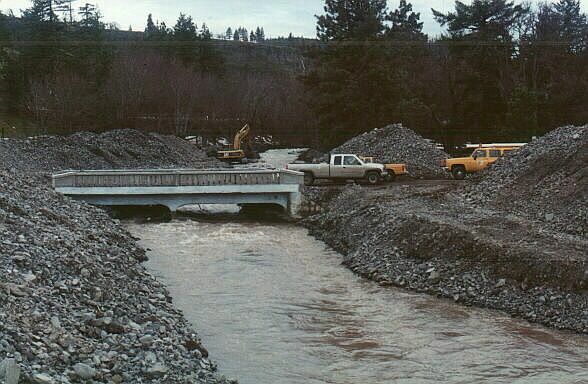 A large trackhoe worked to clear the rock from the creek, 24 hours per day the first week. It then continued to work during daylight hours for the next two weeks. Another shot of the split in the creek. Gravel and rock filled the creek bed under the railroad bridge. 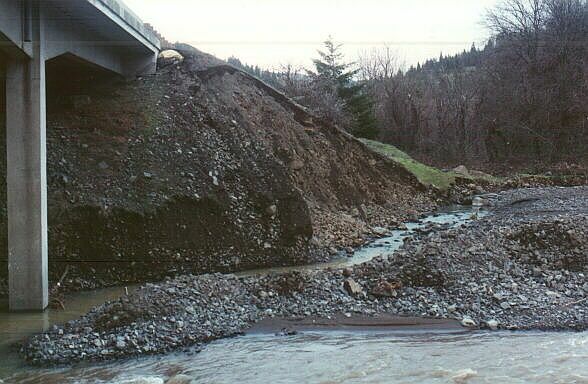 The State was also worried about the damage to I-84 as the water was cutting into the Eastern side of the I84 overpass. They diverted the creek away from the East side with a gravel bank that was pushed up by a cat. 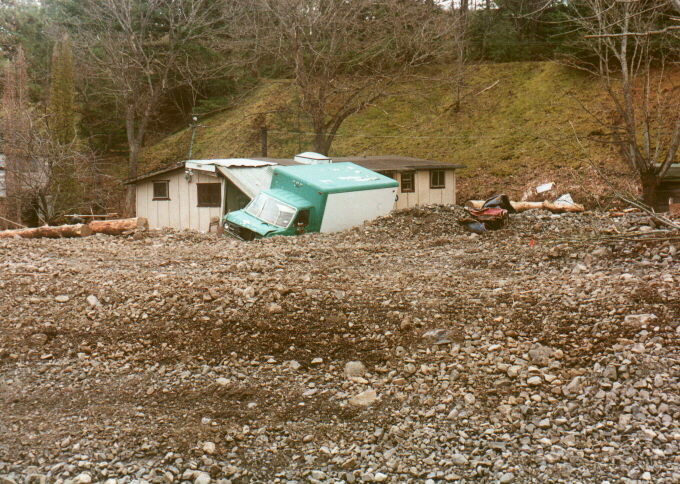 The flood destroyed a lot of private equipment and at least one house North of the old highway. Here is another shot from the same area. 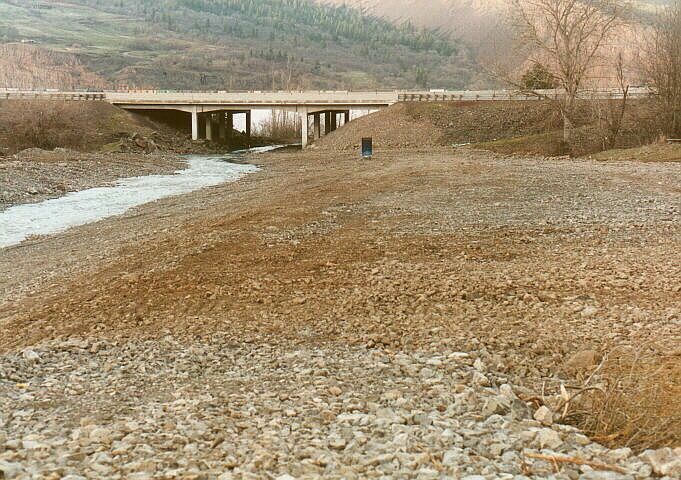 The state came back in and cleaned up the Rock Creek parking lot and made a more defined creek bed all the way out to the Columbia River. 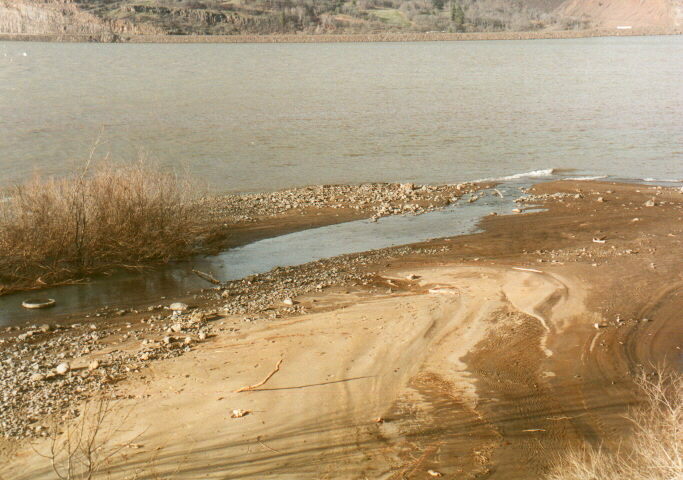 The high water deposited sand from Mosier Creek on the beach. This beach used to be almost totally rock but now we have a lot of sand. Every year we have high water we get more sand from Mosier Creek. This area still needs a lot of work. The CGWA has been working in this area for about 10 years doing clean up and junk removal. We have put wire around all the trees on the beach to keep beaver from eating them. We have also done a lot of parking lot clean up as there were many large rocks to be removed after the flood. 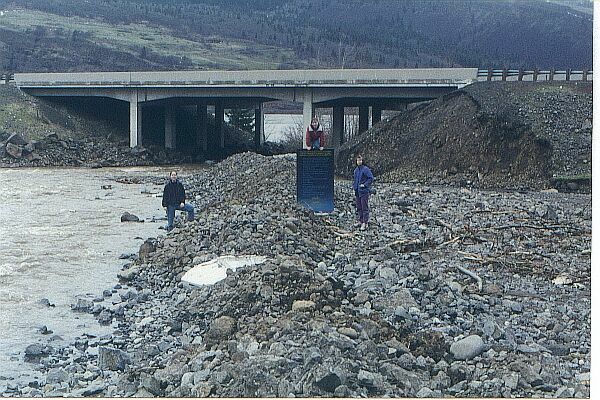 The entrance road was installed by the State after the flood and it was put in with too much slope. This has been a continous problem because cars spin big holes in the road and they need to be filled. The area now has a lot of fill that came with the flood. Before any real changes could be made to the area, a survey needed to be done. The CGWA worked out a deal with two engineering companies to do the survey with donated labor. These two companies were Serac Engineering from Bend Oregon and Crane and Merseth from Portland Oregon. That is now complete and we are ready to start with the next phase of Rock Creek improvements. Hopefully this will mean fixing the entrance road by either making a new one, on property owned by the City of Mosier, or working out some sort of deal with the private land owner who owns the current entrance. The parking lot needs to be smoothed out and then covered with crushed rock to make a real parking surface. We also hope to add perminent restroom facilities. The listing of the salmon has been a problem for Rock Creek. Water runs in the creek from December to May. There are both salmon and steelhead in the creek during that portion of the year. 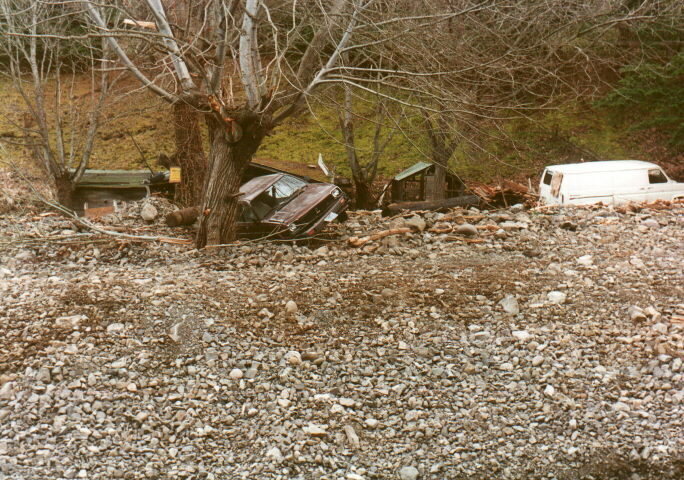 The salmon rules state that people should not park cars in a creek bed even if there is no water. Signs were put up in the summer of 2000 to let people know what the rules were. In general people have been willing to live with the rules once they understood why they could not park in the creek. The rules also state that we should not be driving through the creek when there is water running. We may have to put a gate across the road to stop people from driving down during the winter months or we might place a small bridge across the creek to allow access during the winter.